Oh, the spring is a wonderful thing. 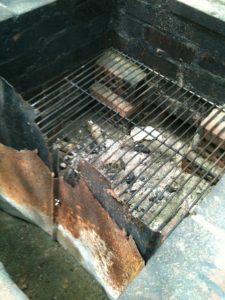 Despite the gag-inducing pollen in Atlanta, warm weather means more cooking outside – so I decided to fix the Beast. 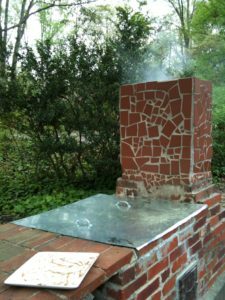 In 2002, I was determined to make a brick BBQ because we had some bricks laying around. 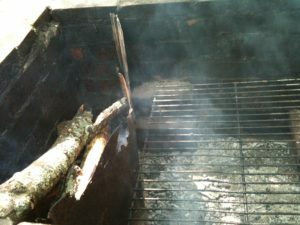 And lots of trees – oaks and hickorys, all there for the proper using in a wood burning BBQ. 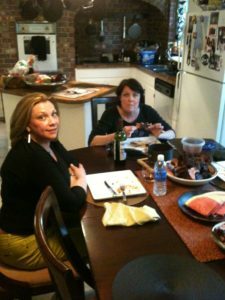 I didn’t know anything about making a BBQ but did it anyway – I am never one to let things like that stop me. The Beast was a true champ for years – but in time, my ill-conceived design started to show some age, and it got to a point where I did not use her so often, because it was becoming a lot of effort. Then it fell into more disrepair, and I did not even think about using her for well over a year. I honestly couldn’t use her safely or effectively – she was down for the count it seemed. But this year, I wanted her back – so I spent Easter weekend cleaning her out, mixing concrete, and repairing her. She’s an ugly old bird anyway – I simply wanted her to work as she once did, which was perfectly. Long story short, I made a new top and even put handles in it – then I smashed down the edges of the new top with a brick, so it fits this thing exclusively. I reattached the fire door, which is handy when it is operating. I also concreted bricks inside, both to hold the grill and to prop the new metal wall I added. The idea was, build a big fire, and then use the metal wall to pull it all to one side, away from the meat. So I went into the yard and pulled up some big hickory branches, busting them into proper size. It had been a while, so there was plenty of stuff to find…I filled a wheelbarrow in a couple minutes. Took me no time to get it blazing – and I kept feeding it for a while, making it big and hot. 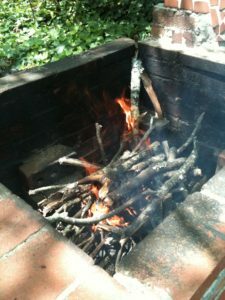 Once I had the fire going good, I tried to use the metal wall to slide it all over to one side. What I did not consider, was just how hot it would become in there, and how moving it around was like reaching into Satan’s colon. But I used a big metal bar I had, and got the majority of it where I needed it to be…then forced the wall in there to hold it all. That worked really well actually – but actually moving the fire and coals, not so much. I got them all in place though, and put more fresh wood on it to keep it going a long time. There was very little fire/coals left on the side where I put the grill back in. 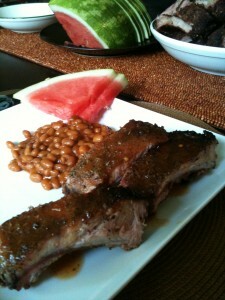 So for her inaugural rebirth run, I wanted to make ribs, one of my favorite BBQ specialties. 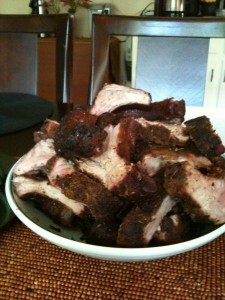 I had some old ribs in the freezer, so thawed them out – had 6 racks of baby backs. Made a dry rub and while I built the fire, I had them sitting in it. I wanted to see what the Beast could do on her own merits, especially indirectly, so I simply put the ribs on the grill, away from the fire/coals. Now the way she always worked in the past, once you got a good flow going thru the chimney, it always held. But the wall inside, and maybe the bricks I concreted in there to hold the grill, were changing the flow, and it was not so consistent. When it works well it works well – and smoke billows steadily thru the chimney. 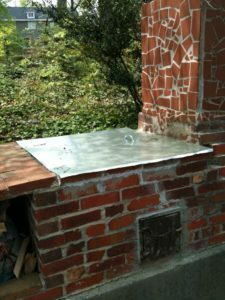 But the wall was making the smoke stop in the cooking chamber, opposed to flowing out – so I had to prime the chimney multiple times by lighting a piece of paper, and dropping it down. 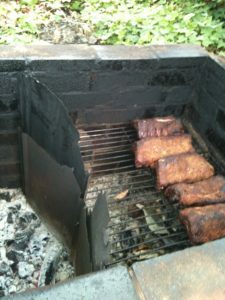 But it cooked all afternoon, and I left the ribs where I put them on the grill, only tending the fire and air flow. After about 3 hours, they were done – and the heat was NEVER direct on them. I could’ve had this a lot hotter, actually – so maybe next time, I blend in some wood-based charcoal or something. 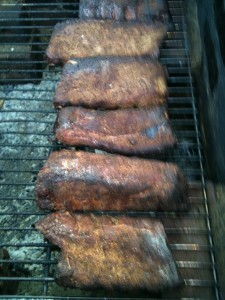 Still, the rub was great, and the ribs were fabulous. I cut them all individually (they don’t shrink so much if you cook them like this), and noted a decent smoke ring. I don’t always sauce my ribs – sometimes I do, but sometimes I do like to make and serve them dry. 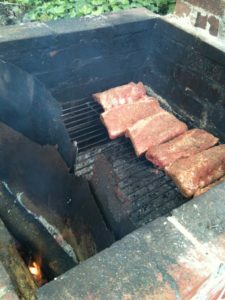 I made a Carolina BBQ sauce for these, which is very vinegary and watery – but it was PERFECT for the ribs…they needed it, but you didn’t know until you tried it. So the Beast is back – and though I need to figure out how to maximize that air flow again, in the meantime, I will enjoy feeding my wife and friends ribs, briskets, turkeys and whatever else I decide needs to be slow cooked this summer! ooh, that is inspiring Marty! glad you are well. I am – but more importantly, the Beast is back.